This five unit apartment complex in West Hollywood is a minimalist's dream with its simple material palette, loft-style floor plan, tall ceilings and abundant daylight. Designed by Brooks + Scarpa to meet demand for decent loft space in the area, Orange Grove is sensitive to the surrounding neighborhood in its design and choice of materials. Sustainability is embodied in the project’s passive design, indoor air quality, and sustainable material selections. 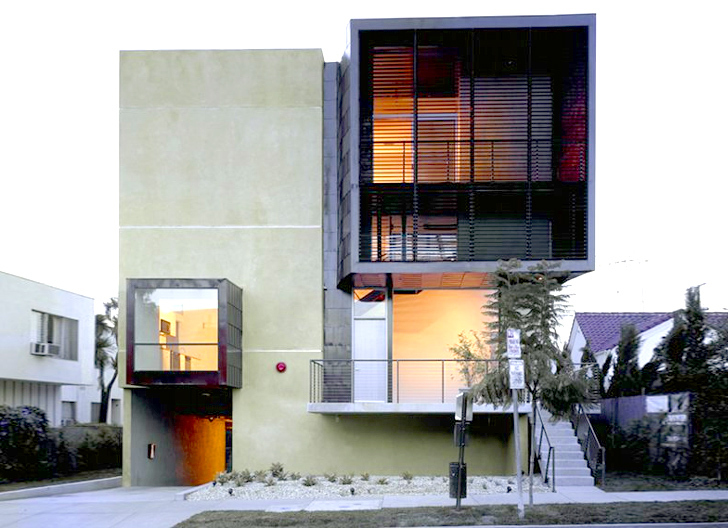 Orange Grove is a long slender building in West Hollywood with five apartments all situated along a north/south axis. Brooks + Scarpa designed this 6,700 sq ft building with a plan to create loft-style apartments with ceiling heights up to 30 ft. The materials and floor plans are very simple, using only stucco, steel, glass and wood. Each apartment is a spacious 1 bedroom, with a large open downstairs for living, dining and a kitchen. An open stairway leads up to a landing and then up to the bedroom. The open floor plan and minimal finishes allow the owner to furnish the apartments as they like. Each apartment enjoys a balcony, passive design, abundant, natural daylighting and natural ventilation. “The common misconception with sustainability is that you need to see it,” says Larry Scarpa, FAIA in an email to us, “I think the best sustainable buildings are when you don’t.” With the north/south orientation, each unit has cross ventilation and an operable skylight pulls air up and out of the unit. Materials are all natural and includes naturally pigmented stucco, recycled oxidized cold rolled steel, and exposed concrete finishes. Paints are low or no VOC, HVAC units have a very high SEER and 75% of construction waste was recycled. These minimalist apartments don’t have many bells or whistles, but they come loaded with simple, sustainable design. Orange Grove is a long slender building in West Hollywood with five apartments all situated along a north/south axis. Brooks + Scarpa designed this 6,700 sq ft building with a plan to create loft-style apartments with ceiling heights up to 30 ft. The materials and the floor plans are very simple, using only stucco, steel, glass and wood. Each apartment is a spacious 1 bedroom, with a large open downstairs for living, dining and a kitchen. An open stairway leads up to a landing and then up to the bedroom. The open floor plan and minimal finishes allows the owner to furnish the apartment as he or she likes. Each apartment enjoys a balcony, passive design, abundant, natural daylighting and natural ventilation. "The common misconception with sustainability is that you need to see it," says Larry Scarpa, FAIA in an email to us, "I think the best sustainable buildings are when you don’t." With the north/south orientation, each unit has cross ventilation and an operable skylight pulls air up and out of the unit. Materials are all natural and includes naturally pigmented stucco, recycled oxidized cold rolled steel, and exposed concrete finishes. Paints are low or no VOC, HVAC units have a very high SEER and 75% of construction waste was recycled. 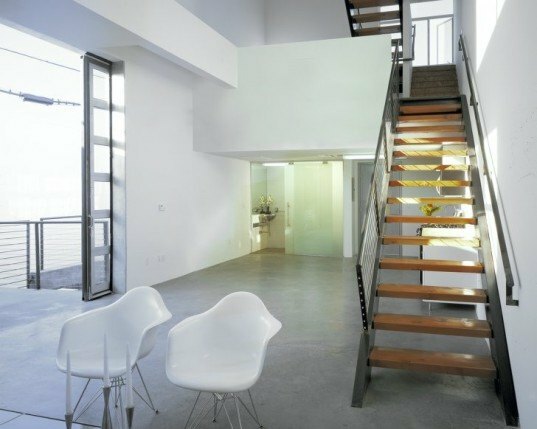 These minimalist apartments don't have many bells or whistles, but they come loaded with simple, sustainable design.